BB1 lies as a deep depression at 22.4N and 88.5E, 50 kms NW of Kolkata. On crossing over Kolkata, the city had 107 mms of rain at Alipore and 117 mms of rain at the airport, in 9hrs on Friday. Currently on the mentioned location, the pressure is at 990 mb. As mentioned yesterday, there are 2 possibilities for the system to track. -1. BB1could track North/North-West, thru Northern parts of Bengal and into the Northern trough. By Saturday evening, it would weaken a bit, and move into Central and Eastern parts of Nepal. Fizzle out by Monday over the Nepal Himalayas. Result: Heavy rains on Sat in Bengal, Bihar, Jharkhand and Central/Eastern Nepal. Also good rainfall in Eastern U.P. In this case, rainfall along the west coast would weaken from Monday, and a "break monsoon" situation" of reduced rainfall in Mah, Gujarat, Karnataka and west M.P. would prevail. -2. BB1 would track West/NW, and move along into Chattisgarh by Saturday/ Sunday. Later moving west, it would track into M.P. and fizzle out there by Mon/Tues. 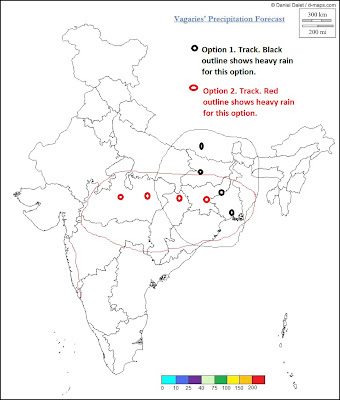 Here, heavy rain in Bengal and Bihar and Jharkhand on Sat, and then in M.P. and Vidharbha on Sun. On Sunday, rainfall could increase along the west coast as the system moves westinto M.P. System would fizzle out by Tuesday over west M.P. Vagaries would go in for scenario No. 1.The first option seems more probable. Saturday/Sunday: Uncomfortable humid heat. Sunny intervals with some showers, but not prolonged. Passing showers will be sharp. Rain amounts about 25 mms per day. good for interior maharashtra. Maharastra last year had extremely good rains. Meanwhile some of the worst rainfall in southern regions - some no rain or single digit since june 01 2011. Government should have plans to divert coastal rivers to interiors else drought results as usual in interior regions. Bangalore and Mysore are some the places growing exponentially up everyyear with no proper rains or lakes to feed the evergrowing city population. Infact water/power for Bangalore comes from cauvery which is extremely far from city making water an expensive commodity. Over few dried lakes, buildings have come up. Here in Kathmandu, Nepal (part of eastern or central Nepal), it has been raining continuously from yesterday evening till 10 AM (Indian Standard Time : 9:45 AM) this morning. This is the first major rainfall of this monsoon season. One indicator here that the monsoon has arrived is the look into the minimum temperature. For the rest of the year, the minimum temperature tends to remain below 19 degrees centigrade. During three monsoon months its always above 19 C, (around 20 to 21 C). The average yearly rainfall for Kathmandu is 1440 mm. The average for June,July,August and September is 1130 mm. The Average for June is 260 mm, of which 140mm has fallen till now. Seeing this rain from yesterday evening, i deduce the monsoon trough is running very near to Nepal. Hence, the chances are the low will track itself through this trough, hence option 1 seems plausible. sset, trust you ! Pradeep gives the toppers, and you inform readers with the lowest in the country !! Rivers diversion? Yes, Nehru had that plan too. So its a 60 years old plan. svt.My forecast is made on the previous xperiance of a system moving along a trough line. and similar situations from the past.And the line, as Neeraj says, is strong in the North. Very good interpretation on rainfall deficiency in southern states. However that will all come under [Deficient= -20% to -59 %] or some time NORMAL i.e -19% to +19%. It is a wide range. Still I do not know on what assumptions these NORMAL and DEFICIENT are categorized by IMD. Linking of rivers is as told by Rajesh a 60 year old project. There is no vision among Politicians. There is no mission among Scientists and Engineers. As per NRL 99B is showing as canceled. RSMC - IMD will continue to issue warnings if they are still strong enough even after crossing the land. hey...was seeing the satellite images..looks like it tracked west...so it took the red track as per your chart..or is it too early to call?? break monsoons can last from 5 days to the longest ever which was 21 days. Seems inevitable, but too early to give a call for July. Lets see vagaries' June estimate result . Track as shown in post.Could still go either way. in previous msg track meant for BB1..